When Willy Russell’s heart-warming comedy SHIRLEY VALENTINE first premiered at the Everyman Theatre in Liverpool in 1986, the one-woman play took the world by storm. Now, in celebration of its 30th anniversary, Jodie Prenger takes on the lead role in the first major revival of the much loved national treasure. Set in Liverpool in the 1980s, SHIRLEY VALENTINE tells the story a middle-aged Liverpool housewife trapped in a loveless marriage. When her best friend offers her a trip to Greece for two weeks out of the blue, she secretly packs her bags and heads for the sun, unexpectedly rediscovering her dreams, her love of life and herself in the process. While the social landscape may have changed drastically over the past three decades, Russell’s funny and heart-warming social comedy still feels fresh as ever. The play’s themes of loneliness, emotional stagnation and self-transformation are still hugely relevant and the fiercely sharp and funny script still stands the test of time. 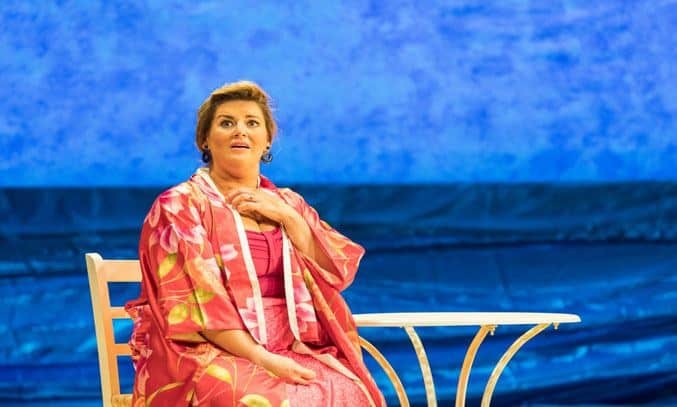 Jodie Prenger proves herself as a formidable actress, holding the audience’s attention for almost two hours in the one-character, three act play as Shirley. Prenger clearly has a gift for storytelling and comedy, delivering an engaging performance full of energy and heart, as well as vulnerability. Where she truly excels is in acting the supporting roles, moving effortlessly from a Scouse to Greek accent, bringing to life the characters that inhabit Shirley’s world, even if at times, she presses the humour a little too forcefully. The only real disappointment is Amy Yardley’s set design. While the detailed kitchen in the first half is, for the most part, impressive, the Greek landscape is second half is disappointingly underwhelming and almost cartoon like appearance with its plastic rocks and garish blue painted backdrop. That said, there is plenty to like about this production, most notably Prenger’s engaging performance. All in all, this is a satisfying revival of Russell’s classic play.